If anyone at Vice sees this - please don't get mad or sue us. We don't have any money. We are just big fans. We like to sketch on the walls because it helps to get some space for our ideas. Sketching all over the walls also gives our space that manic-psycho-killer vibe that most design school kids feel at home in. This is a sketch of the current value proposition for Vice Media. Conrad and I discerned that this is the current value proposition for the company after researching extensively, considering the most recent media kits from Vice, and talking to a designer director at Vice. This is a sketch of what Conrad and I see as the value proposition of Vice Media five years from now. 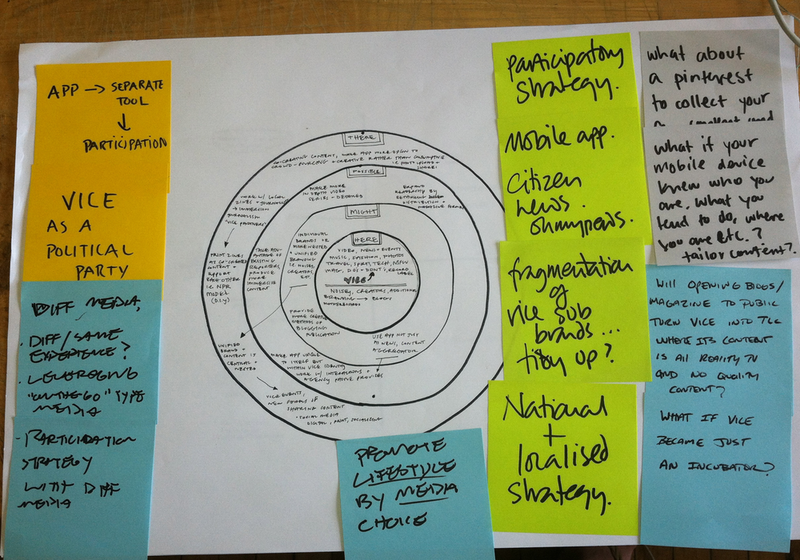 "Here and There" is a tool that Gill Wildman from PlotLondon shared with us in her StrategyLAB course. "Here and There" helps you understand and dissect what is happening right now in a company, but also makes you imagine all of the possibilities in between the present and the future. The steps in between the "Here and There" are "What is a real possibility for the future?" and, "What might be a possibility for the future?" Feedback and criticism was especially formative in this project. Pin-ups and presenting where we were in the process helped push our vision forward create a solid strategy for the company. When Conrad and I sketched, we were able to communicate our vision for the print version of Vice's Media Kit for 2018 in ways that our words could not. Bringing our vision into a physical space also helped us to give criticism and self-edit. Getting everything out in front of me and being able to make rapid changes is important.